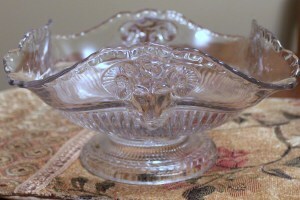 ~ Let's talk vintage crystal/elegant glass/glass, share pattern IDs and enjoy the shared pleasure of collecting. I was (and still am) thrilled to have acquired this piece, line 432 in Peach Blo. It is very pretty. 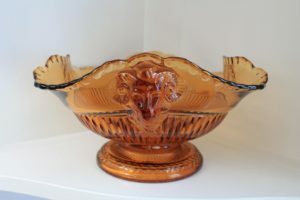 While I am still looking for colours in line 432 I did come across this pretty amber piece – line 3500/27. 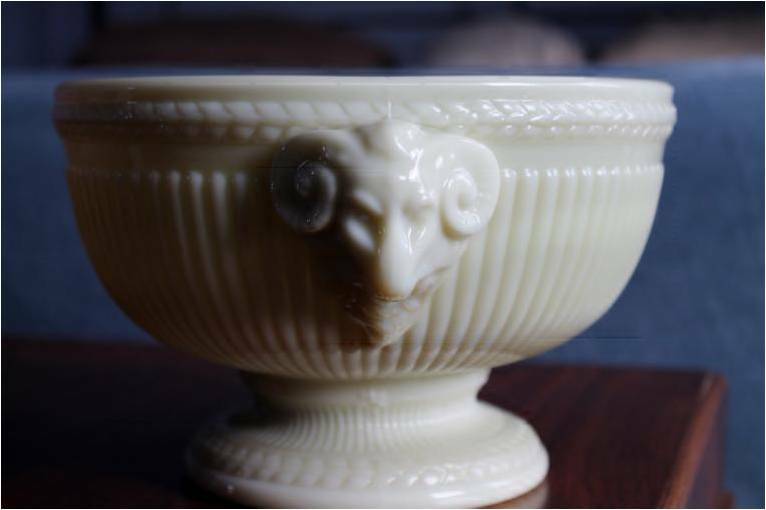 Almost had a line on a Tuscan bowl in line 3500/25 but I misunderstood the rules of the live online auction and it was sold to some other lucky collector! Happy, happy, happy! 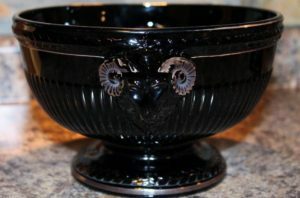 Have looked a long time for the line #432 bowl in ebony with gold decorations. Absolutely gorgeous. Missed one in Tuscan (pink) recently. That’s on my radar now however. This one is line 3500/26. I don’t know for sure what shade of blue this is. Cambridge made a number of different transparent blues. I am guessing that this is ‘Willow Blue’….but don’t know for sure. Happy, happy, happy. Gorgeous ivory. Glows a pretty green under a black light. Now on to the ebony or tuscan! I figured I should add the Tuscan candle holder. Maybe posting it will ‘attract’ a bowl! Woo hoo…..I finally acquired a bowl in Helio. I have seen a few of these online and while I never was able to justify the cost of buying another, I just bought it. If I had to wait to justify it, it would never have been purchased. 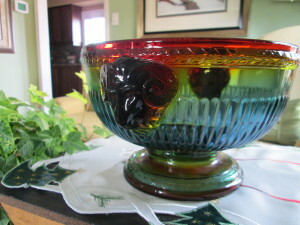 According to the book Colors in Cambridge Glass II by the National Cambridge Collectors, Inc. Helio was introduced in January 1923. The book goes on to day that Helio was likely only produced for two years. So this piece was made in 1924 at the latest. 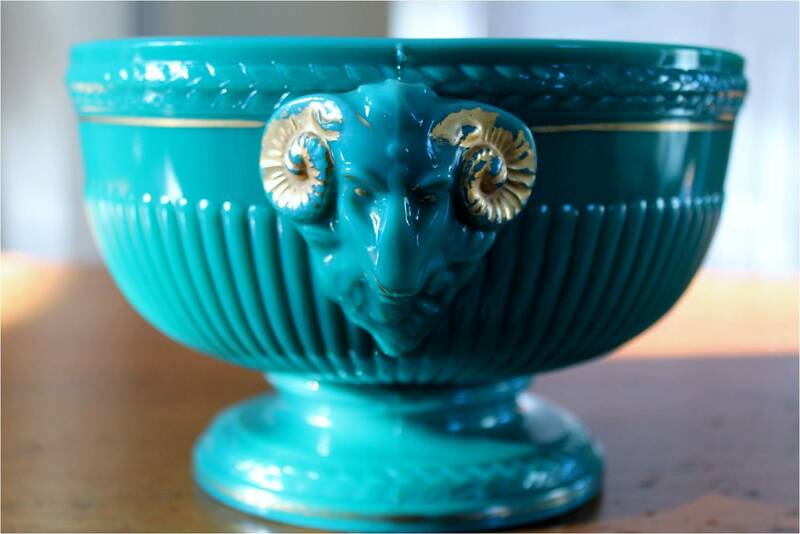 Obtaining bowls in the colours I don’t own will be more difficult. 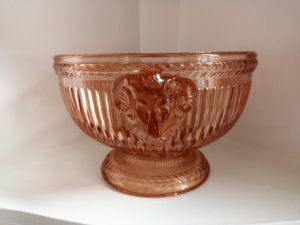 I have seen the Tuscan bowl advertised at an online auction, but have never seen any other colours for sale online or in person. I’d love to get them in the ebony and the ivory (at least). Last one, so far…….This is the jade with gold details. 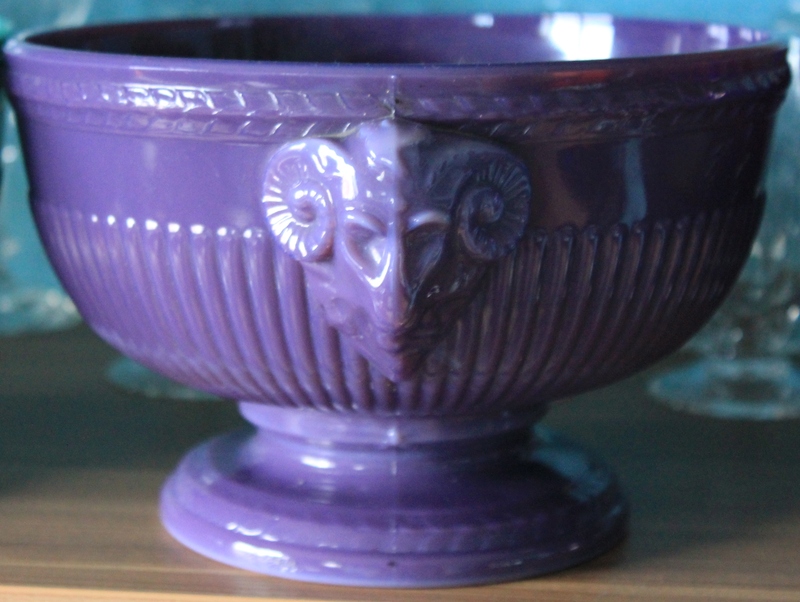 The colour isn’t well reproduced here, but it is lovely. I am looking for one in ebony. Haven’t come across one. I let one in helio (pinky/purple) ‘get’ away. Still cross about it! 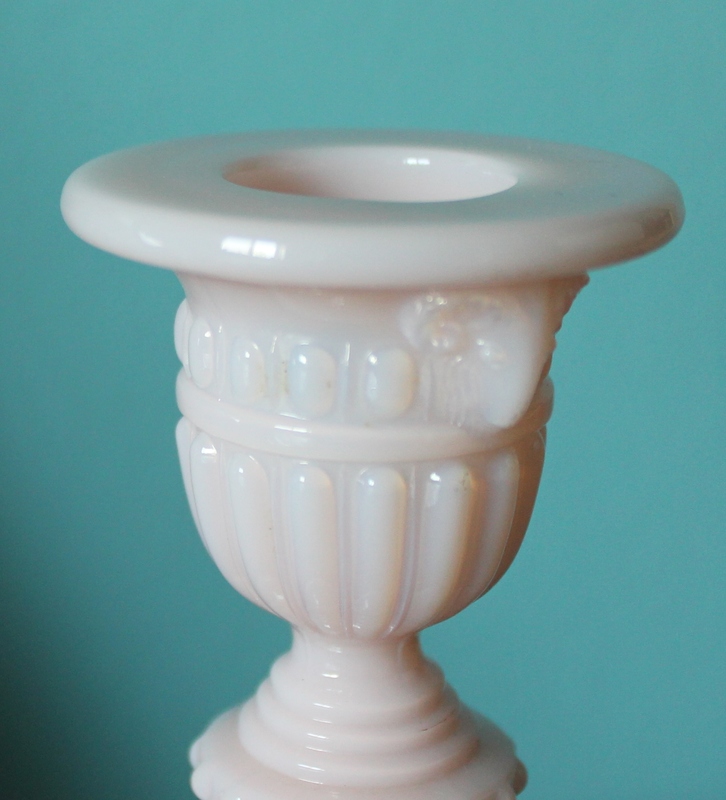 I bought one Rams Head single candle holder in the Tuscan pink. Unfortunately, due to complete idiocy, I had it sent to my daughter’s house – 2,000 miles away. I am visiting in June and am looking forward to picking it up. I added to my rams head bowl collection recently. Another bowl – line #3500/432. This piece is Cambridge’s Azurite colour. Here’s an article by Lynn Welker on Azurite pieces by Cambridge. 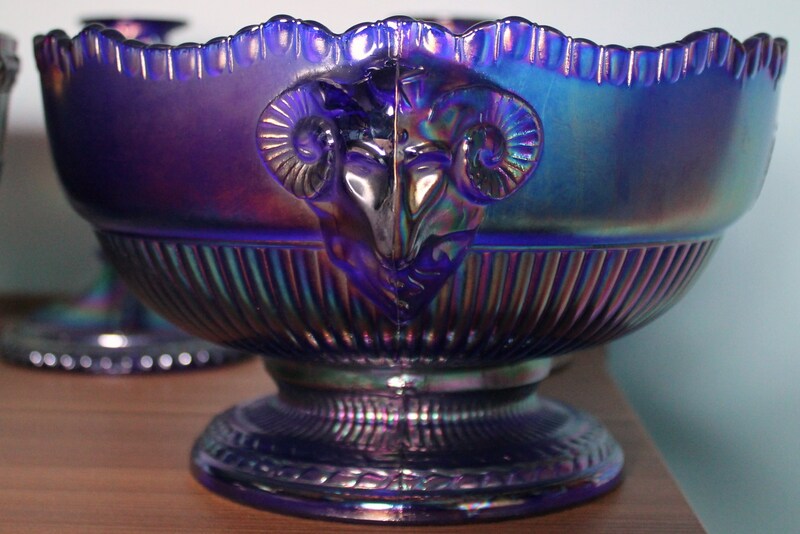 This pretty cobalt (Aurora Jewels) console set was made by Imperial Glass. The bowl has Imperial’s “IG” signature. Imperial bought the moulds from Cambridge, when it closed, in the 1960s. Imperial only made the set in cobalt. 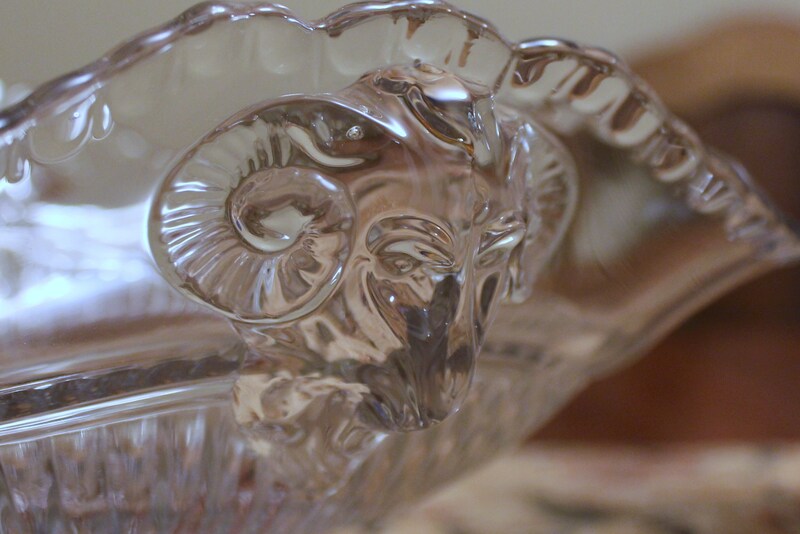 I have recently added a few ram’s head items to my collections. I have some thoughts about accumulating them for awhile and just displaying them in my office. I don’t know why I find them so interesting. The details aren’t pretty. In fact they are somewhat ominous. But….I like them. This is Cambridge’s line #3500/27. The item below is line #3500/432. I have long longed for a Rams Head Bowl. Over the years I have coveted them in azurite (absolutely gorgeous) or in crystal with an etch of some sort. The first one I saw had Fostoria’s Elaine etch. But they were just too darned expensive. Recently I came across this piece online on Etsy. I ‘favourited it”, but never really entertained any thoughts of buying it. A couple weeks ago I was reading an article in the newspaper that spoke about people buying gifts for themselves at Christmas time. The suggestion was that folks are getting over their guilt at treating themselves when they are shopping for others. Obviously this is quite true as I took possession of this bowl yesterday. I am glad I did! “This fine color line of Cambridge Glass was introduced to the public January 25, 1925. I wanted to show how the colours blend so I took photos from the different angles, including a look at the base. 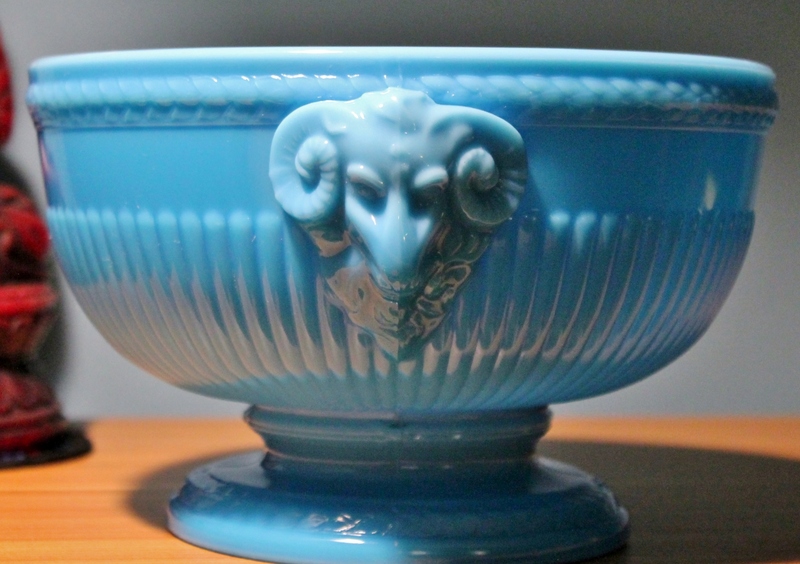 I gather these pieces are not plentiful and that the rams head bowl is rare to find. I consider myself lucky. It is gorgeous and at least at this point in time, is a keeper. Posted by d.b. in S. Reich & Co. I have been posting the pretty amber pieces I bought recently at Twindmills. This candlestick was included in the purchases. Again I had no idea of its provenance, but I was attracted to its deep, rich dark amber colour. 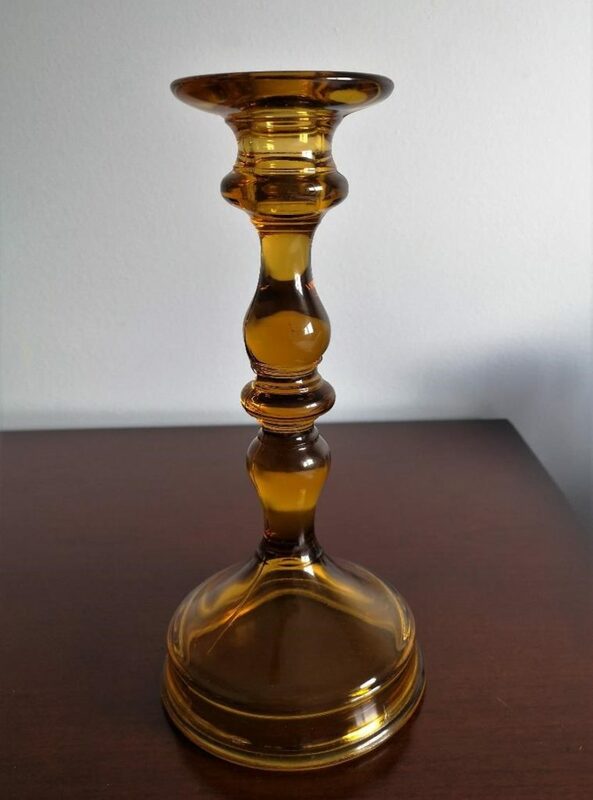 I posted it on the Vintage Glass Identification Facebook site and it took no time until someone posted an ID. I would never have found it in a million years otherwise. The Glass Message Board has posted a number of the company’s catalogues. I know very, very little (really nothing!) 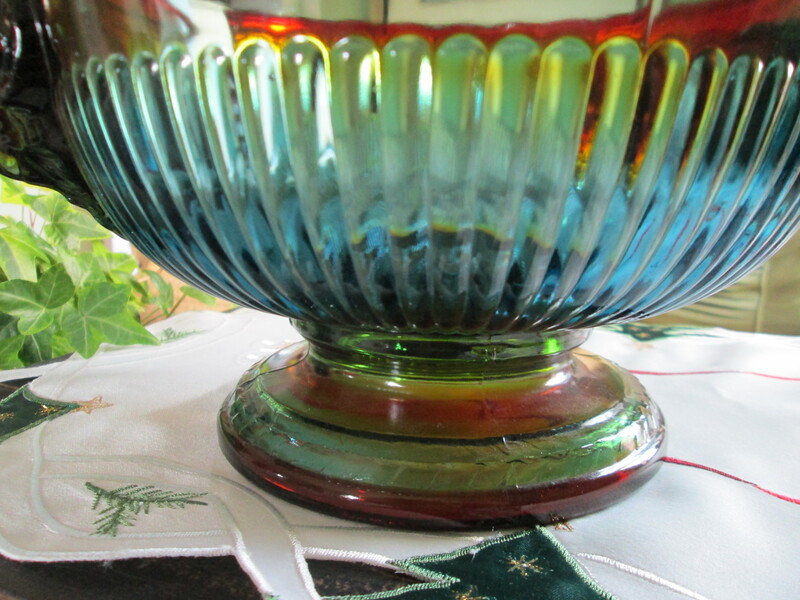 about European glass and am lucky that others share their knowledge. 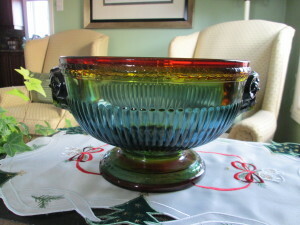 I bought this piece along with a few others at the Twindmill Markets in Colborne. The vendor had set up a nice table with quite a few pieces of amber, with a 30% off price and it definitely caught my eye. The different shades of amber were also interesting to see. I have had alot of help identifying the pieces. 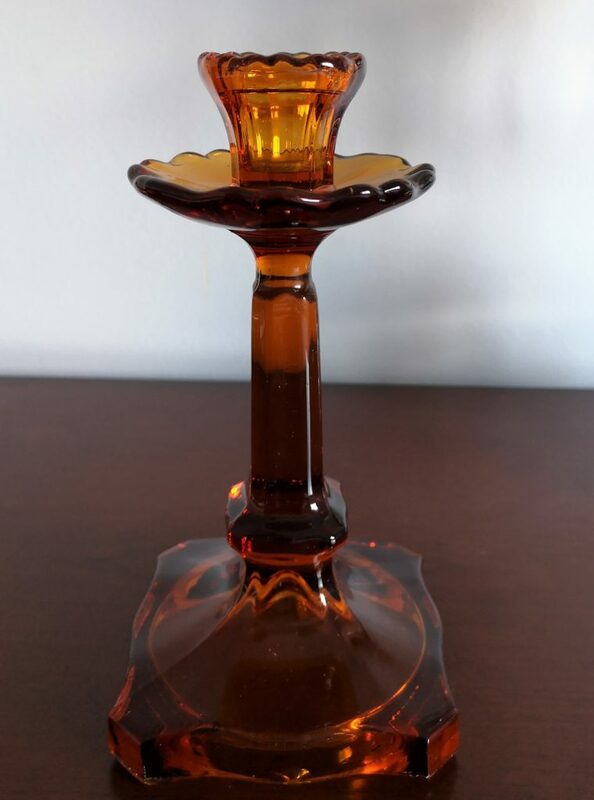 I found this candlestick in The Collector’s Encyclopedia of Glass Candlesticks (p. 139) by Margaret and Doug Archer. The only problem was that there were two that looked very much alike – one by Paden City (No. 117) and this one by Tiffin Glass (No. 76). 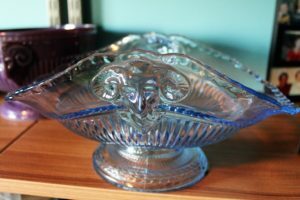 I turned to the experts at the Elegant and Everyday Glass Forum for some advice. The opinion of two folks that responded was that the Paden City pieces are smaller than the Tiffin piece and that this was likely Tiffin. 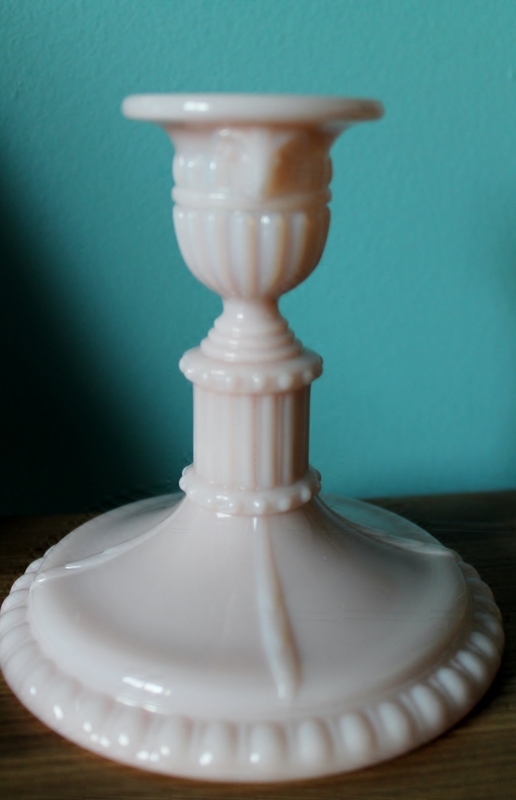 This candlestick stands 9- 9 1/8 inches tall. . This is a great site from which to seek advice. Lots of well-informed folks monitor and administer this website. 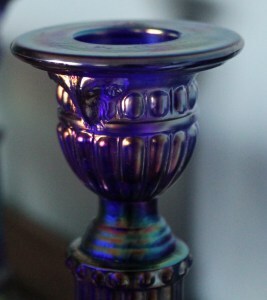 Subsequently I have seen online that these candlesticks were part of a set with a console bowl. d.b. said Thank you. d.b.